In a world without tape, the audio interface has become the gateway to preserving sound for many people. Having your inputs, outputs, and conversion in one small box provides a cost effective alternative to discrete units. However, with such a saturated market, finding the right audio interface is now harder than ever! Most people consider the number of inputs and outputs to be one of the biggest criteria for choosing an audio interface. The problem with this assumption is that not all ins and outs are created equal. Further, different situations call for different connections, and in different numbers. Advertising a 16x12 interface does not really say anything about the connections themselves! When most people think of audio interface inputs they think XLR. Why? Because this is what we plug our microphones into. A lot of units also use what are known as combi-jacks. These special XLR inputs actually have a 1/4 inch jack in the middle of the XLR. This allows you to easily connect guitars, keyboards, or other line level devices straight into the audio interface. An XLR out is sometimes included as well. These are typically used for connecting to balanced studio monitors, however some are AES/EBU digital connections. Make sure you know which it is! Unlike the combi-jack XLRs above, a dedicated 1/4'' input is usually reserved for strict line level signals. Also, these connections on an audio interface almost never have a gain control. Why? Because often times you send external mic pres, compressor effects, etc. through these inputs, all of which have their own gain controls. This effectively makes 1/4'' inputs a path for digital conversion, not gain control. 1/4'' outs are also typically line level, and are often used to go various speaker sources. However, some units do have 1/4'' outs that are never converted to digital. These are excellent for headphone monitoring mixers given they are usually zero-latency. You can also go to a dedicated A/D unit as well. 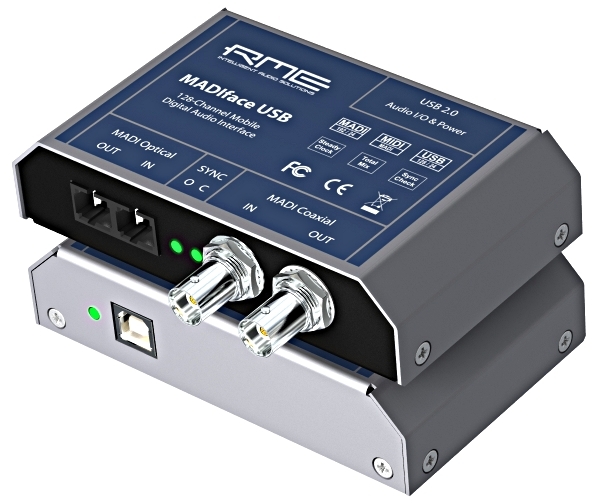 These inputs come in a wide variety of various connection styles and formats, but traditionally come in AES, ADAT, MADI, or SPDIF. Since these signals are already amplified and digital, they are instead used to sync and combine various audio interfaces. Why? Because ASIO does not directly support combining unsynced signals, and while Macs can do this via Core Audio, it generally is not as stable. As you can probably guess, the ins and outs on an interface are an easy source of marketing confusion and manipulation. For example, an interface might advertise as being 16x12, 16 in and 12 out. However, eight of those outputs might be via ADAT and another two might be the stereo headphone jack, meaning there would only be one L-R output! Are they lying to you? No. But is it deceptive? You bet! If inputs and outputs were all that mattered, then things would easy! Unfortunately audio engineers need more than just a few ins and outs. Understanding what the available options are, and how they impact our workflow, can make the decision process much easier. Probably one of the most useful features to find on a audio interface is a pad. When tracking drums or other loud sources, especially with condenser microphones, the risk of clipping your inputs runs high. There is also a risk when running line level into the unit and not having a gain control on the other end. While just about every audio interface with mic inputs has phantom power now, how it is implemented can be quite different. It is not uncommon to see phantom controlled in banks of 4 or 8. While phantom power will not hurt modern ribbon or dynamic microphones, it can be problematic with older mics. Thankfully some units do include individual phantom power control on each channel. If you do not have a direct box, but want to record a lot of direct guitar, having a Hi-Z input can be a wonderful thing. These special 1/4'' inputs mimic the impedance of a guitar amplifier, and can render a more true guitar tone. Typically a interface with this feature only has one or two inputs that are Hi-Z. This fancy input is actually a special version of ADAT. Normally, when you double your sampling rate, you cut your channel count over ADAT in half. (8 channels of ADAT becomes 4 at 96k.) However, a S/MUX capable audio interface will maintain full channel count over one cable up to at least 96k. This makes connecting multiple units much easier when recording at high resolutions. Some audio interfaces offer on-board effects processing similar to a live mixer. This is especially useful for tracking when you need a little reverb, but your computer does not have enough oomph to do it in real-time. Further, if you are recording a small show and the act really needs some basic effects, boom—you are ready to supply! Different situations call for different needs. Furthermore, at some point we're all limited by a budget. While it is always safer to over-buy for future proofing, that is not always a viable option. Here are some recommendations. Two or four channel mic inputs - Good for stereo mics, plus maybe a spot or two. High resolution availability - If you intend to release your movie in true high def, you will need high def audio to go with it! Available Phantom power - Almost all broadcast and movie mics are condensers, which need power. Multiple Headphone Outs - Most likely more than one person on set will need to hear what the mics hear. Eight channel mic inputs - Drums always require a lot of mics. You need eight channels minimum, unless you only are going for the Beatles sound. Mic pads - Drums are loud loud instruments. As soon as you throw up a pair of condenser overheads you will need to pad them. I guarantee it. Phantom power - As above, you will need phantom power for drum mics. Eight channel mic inputs - More than likely you will need to record a lot of sources. You will need mic inputs. Line level inputs - Being able to capture keys and a live feed from the mixer can always crop up in a live situation. Be prepared! On-board effects - Sometimes you might end up being the mixer! Being able to add effects to the monitor outputs is a great backup if the whole mixer goes out from a rogue beer. Studios with less-than-capable computers will highly benefit from on-board effects for the musicians. Connectivity - Usually you will need anywhere from 16 to 32 channels to cover a live show. This means connecting more than one audio interface. Having S/MUX, MADI, or special protocols (MOTU firewire daisy-chaining for example) makes everything much easier both live and in the studio. Finding just the right audio interface can be tricky! When it doubt always make sure you can expand your rig later so you do not have to try and resell your old units. You also need to take into consideration driver stability. Having your unit fail mid recording is no good! Unfortunately there is no good way to check driver stability other than reading reviews and forums. Remember, always think about what you may need down the road! Thanks for reading!